Parents and Guardians are invited to attend our annual PTA Open House Event on August 29th. We look forward to meeting with our grade 9 parents, and reconnecting with parents of students in grades 10, 11, and 12. RSVP Today! 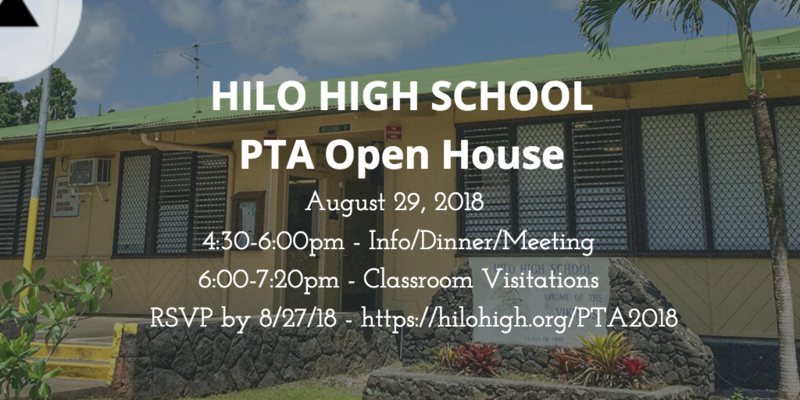 The Hilo High School PTA and Faculty are looking forward to seeing all of our Viking Ohana at our annual PTA Open House event on August 29, 2018. Beginning at 4:30pm at the Cafeteria, attendees will be able to collect information about the year's planned student activities, meet and speak with our counselors, purchase school store items, join the PTA, collect HERO points for attending, and more. A short meeting and information share will begin at 5:15pm with classroom visitations to commence at 6:00pm. School Bells will be rung to signify class changes with 4 minutes of passing in between each class. The rotation will begin with Period One and end at 7:20pm with Period 7. Students are asked to have their schedule information ready to help parents locate classrooms. As we did last school year, a HERO "scavenger hunt" activity will be offered for students attending to earn additional points for visiting their classrooms with their parents/guardians. It remains our hope that all of our families will be able to join us for this important event. Parents are always welcome to visit our website at www.hilohs.k12.hi.us to access contact information for our faculty and staff with any concerns. 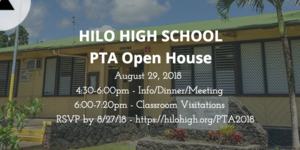 For more information regarding PTA Open House, please contact our school office at (808)313-5500, or you may email us at info@viking.k12.hi.us.